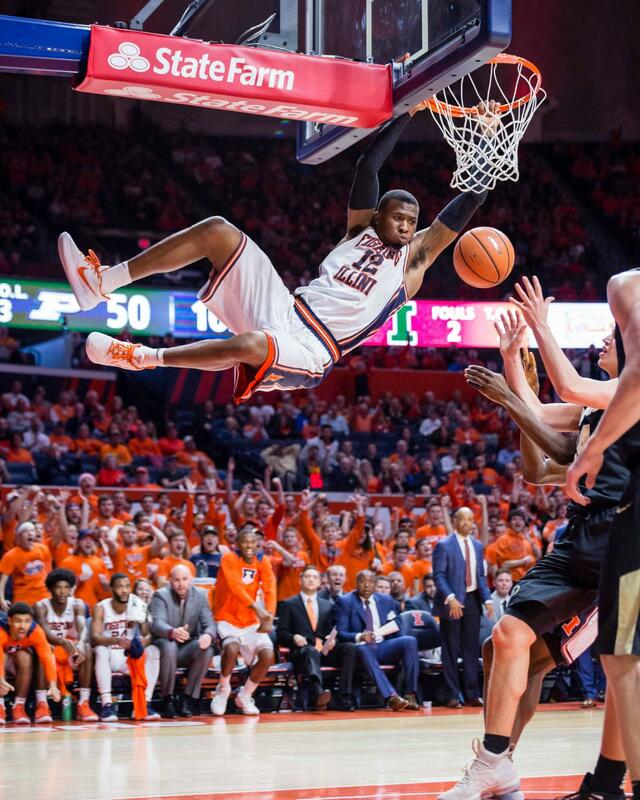 Illinois forward Leron Black (12) dunks the ball during the game against Purdue at the State Farm Center on Thursday, Feb. 22, 2018. The Illini lost 93-86. 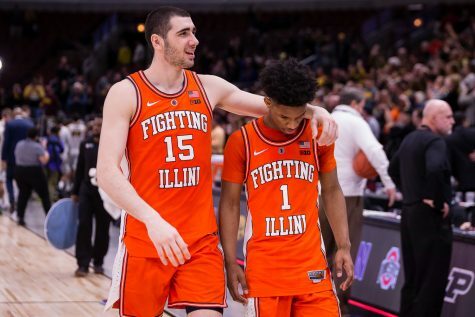 This Illini men’s basketball season was one of many highs and lows ranging from initial tournament hopes, a fifth straight Braggin’ Rights win, heartbreaking losses and many more big moments. 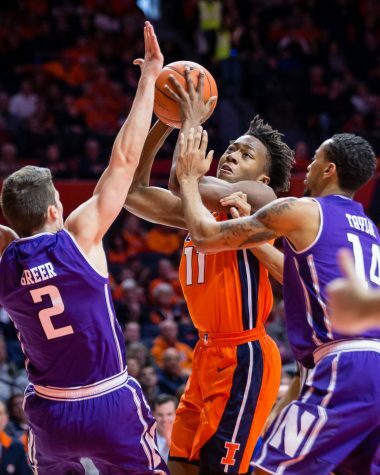 But, it ended shortly, as the Illini were unable to extend their season into March and instead, are home getting ready for next season. Here are a few of the biggest things to take away from this Illini season. It’s important to remember that while there were some tournament hopes this season, this was still the first year of the Brad Underwood era, and was an extremely young and undersized team. 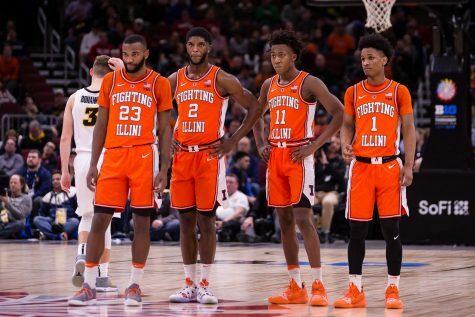 That said, while the record certainly wasn’t the most favorable, the Illini still showed a few very important things for the next few seasons. Leron Black is the leader of this team, and had a phenomenal season. 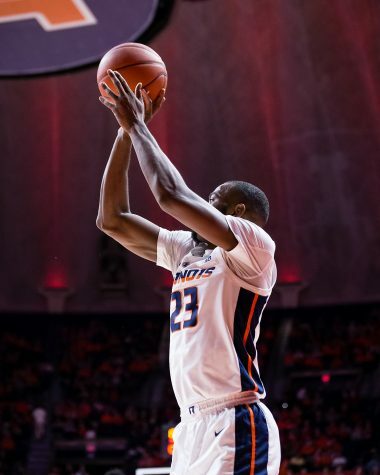 The versatile forward averaged just over 15 points and five boards per game this season, and was the biggest shotmaker in the absence of Illini legend Malcolm Hill. The two are very different players, but it was great to see Black step up and take over this team with a group that was not totally clear on who that guy would be. Black flourished in the role, propelling him to career highs across the board, and one of the most efficient seasons in all of the conference. Black is going to need to do the same next year, and if he can repeat his junior season again, the Illini will be in a great spot. Aside from Black, the Illini flashed plenty of other really nice pieces for the future. Trent Frazier was easily the most welcome addition of all of the freshmen, as he was named to the All-Big Ten freshman team and was even an honorable mention for the All-Big Ten teams as well. The guard averaged just about 13 points per game, and was easily one of the biggest focal points of the entire offense. When things ran through Frazier, it had a noticeably better flow, and led the offense to some of the biggest runs of the year. Nobody expected him to have the type of year he did, let alone to be the best freshman on the team. But, it was a welcome surprise, and he is a great player to build on going into the next season. Kipper Nichols was also a bit of a surprise. After a bit of a slow start, Nichols came out and averaged double figures on the year, including a career high 31 points in the final game of the season against Iowa. On a team that lacks size, Nichols is a really nice in between piece that can run the floor well as a small forward or even the center of the lineup when Underwood feels like playing small ball. His athleticism and ability to stretch the floor open up a ton of room for him and his teammates on offense, and he has the potential to be one of the best players on this team next season. It was great to see him take such a big leap, and I expect him to expand his game even further next season. 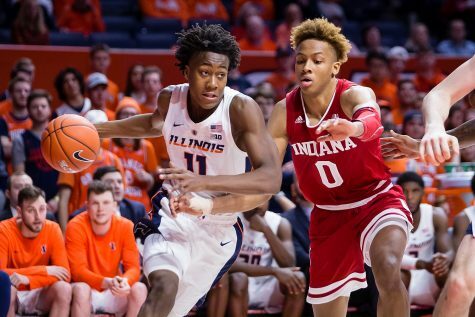 While I could go on and on about all of the players in this team, I think that those three are going to be the biggest factors heading into the next season, along with the welcomed additions of the likes of Ayo Dosunmu and whatever other player sign up to join Underwood and Co. in Champaign. Adding them into the mix with guys like Mark Smith in year two, Aaron Jordan, Gregory Eboigbodin, Te’Jon Lucas, Michael Finke and more, and this has the potential to be a really solid team. 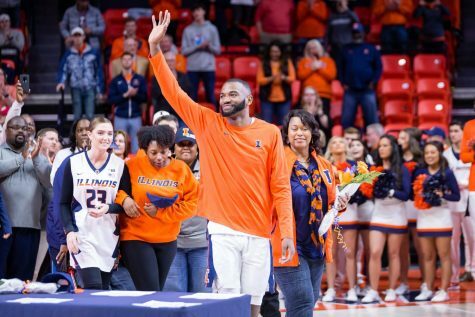 Yes, there are problems, and yes, it’s possible that not everybody mentioned above will still be playing for the Illini next season, but as of now, there is a very nice foundation. By most standards, this was a disappointing season, and rightfully so. Bottom of the conference, losing record, no tournament, etc. While this is extremely fair, and is absolutely justified, I choose to have a different perspective. Sure, the “what-ifs” of the year could have made this a very different season, but the bottom line is that we were unable to finish. 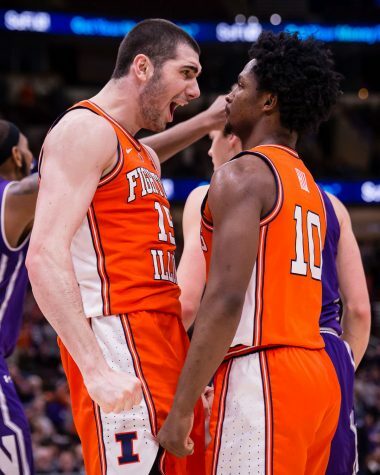 Illinois lost games like Iowa the first time, or Wake Forest or UNLV not because of just one or two mistakes at the end of the game, but because they did not play the full 40 minutes. I’m not saying this to give excuses, because there aren’t any. Play 40 minutes and win, and this is an entirely different season, and the Illini might still be playing. But they didn’t. It’s as simple as that. Instead, I’m saying this because even in a losing season, this team is not as far off as many may think. Obviously you want to see the tournament in year one, but for now, that wasn’t the case. What’s more important to me, is how they set themselves up for the next season, and how they will fare in year two of the Underwood era. By the end of the year, the Illini actually looked really good in most of their games. Sure, Iowa wasn’t pretty, and there was some bad stretches of basketball, but overall the team seemed to have a nice grasp of Underwood’s system. By round two against Michigan State and the game against Purdue, we started to see the offense that was talked about all offseason. Quick scores, alley-oops to lead off the possession, and overall good basketball. Unfortunately it took until February to get it down, but the point is that it is starting to make sense. An entire offseason in the program should do wonders for this team, and I would be shocked if we see the same kind of basketball that we saw in the beginning of this year played at the beginning of next season. Defensively, the Illini were actually pretty solid for the majority of the season. Sure there was the issues guarding big men, but that is to be expected with such a small team. In each and every game, opposing coaches talked about how hard it is to play against Underwood’s defensive sets, and that is a great sign for year one. As long as it took to grasp the offense, the defense was there and will only get better next year with more practice and hopefully more size. So, with that in mind, I do not think this year was an absolute disappointment, and instead, a good introduction. It can be hard to sit here and continue to say “oh what about next year,” but the truth remains that rebuilds take more than just one season. While this year wasn’t the prettiest, and who even knows about next year, the thing to keep in mind is that progress is being made. Underwood didn’t inherit rosters with a Keita Bates-Diop or Miles Bridges or any of those types of guys. 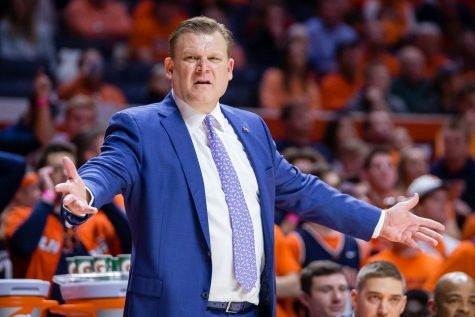 That’s not to discredit Chris Holtmann and what he did with Ohio State this season, but the truth is that Illinois’ roster simply is not as good at basketball as the Buckeyes. But, he can get them, and as of now he has two very solid recruits coming in, with the hopes of adding even more. All in all, it looks to be heading in the right direction, and that in itself is a successful first year for me. As a lifelong Cubs fan, I know that expression all too well, and for this Illini team, it certainly applies. 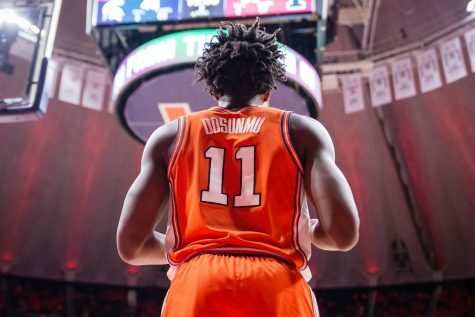 If you do believe that the foundation is there, and that guys like Dosunmu will make big impacts next year, there is no reason to believe that this will not be a good Illinois team next year. Will they compete for the Big Ten with teams like Michigan or Michigan State? Probably not, but they should absolutely be a very solid team next year. Dosunmu in himself adds a whole extra dimension and strengthens an already talented backcourt. Alan Griffin is another athletic wing that has the potential to get some early minutes. And who knows what other players will decide to join that duo. I, like most others, believe that there will be more size added to the team, and that alone makes this group much stronger. The rebuild will be by no means completed next year, but I do wholeheartedly believe this will be a solid team next year, and should be able to make a run at the NCAA Tournament. It’s early to say that, but barring any drastic changes there is no reason that Underwood shouldn’t be able to sneak his way in and win many of the games that the team lost this season. 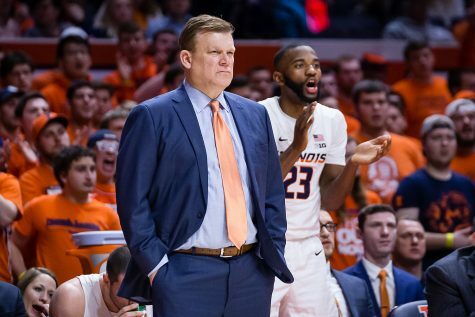 It’s been a crazy year in Illini Basketball, and there is still much to go with recruiting and getting ready for next season, but in the end, it was a first step in the right direction that the team should continue heading down over the next few seasons. The record didn’t show it, but in due time, it should.